Let all the hearsay and rumor cease, the puppet masters at VW have released the complete details on the Audi R8 V10 just in time for Christmas the Detroit Auto Show. 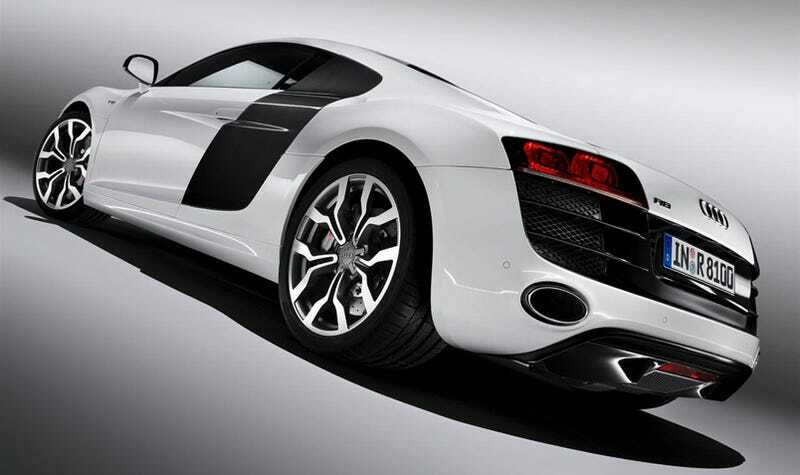 The R8 V10 is a 5.2-liter affair generating officially, 517 HP at a heady 8,000 RPM and 390 lb-ft of torque at 6,500 RPM. All that grunt serves to deliver a 0-to-62 MPH time of 3.9 seconds with a top speed of 196 MPH. But the engine isn't the only place getting enhanced. More details and the press release below. Suspension upgrades come in the form of magnetic ride control aimed at improving both ride and at the limit grip. It rides on new 19-inch ’10-spoke Y design’ wheels hiding 14.9 inch brakes up front 14.0 inches at the rear. The styling gets tweaked with a modified sideblades with bigger intakes in gloss clear finish over carbon fiber. The rear end gets a modified diffuser and oval exhaust tips, all designed to look pretty while it's leaving you in the dust. Audi is sending shockwaves through the sports car establishment yet again with the new R8 V10, a ten-cylinder, 525PS, 196mph evolution of the quattro four-wheel-driven sports car that UK enthusiasts have taken to their hearts. The project that has been the subject of intense speculation since the 2006 launch of the V8-powered R8 is set to come to fruition in January when the new super car opens for UK order priced at £99,575 OTR in manual form, or £104,665 OTR equipped with the R tronic sequential shift transmission. First deliveries are expected next spring. The new 5.2-litre FSI V10 petrol engine mounted longitudinally directly behind the cockpit is almost identical in construction to the unit powering the recently announced R8 LMS that will race at customer level in the GT3 class. It contributes only 31kg more to the overall weight of the all-aluminium-bodied R8 than the existing V8, taking it to 1,620kg, and making possible an impressive power-to-weight ratio of 324PS per ton. Punching out its 525PS maximum at 8,000rpm, and peak torque of 530Nm at 6,500rpm, this exceptional and highly efficient direct injection unit rockets the R8 through the 62mph barrier in just 3.9 seconds as it revs freely to its 8,700rpm limit in each of its six ratios. When linked to the R tronic transmission it can reach 124mph in only 12 seconds, and in the right conditions can maintain its breathtaking momentum all the way to 196mph – an unprecedented high for a road-going Audi. By mounting the ten-cylinder unit as close as possible to the centre of the R8, Audi engineers have achieved near perfect 44 per cent front / 56 per cent rear weight distribution for optimum handling balance. Dry sump engine lubrication – an element specifically derived from racing - also furthers this aim by enabling the V10 to be mounted as close to the road as possible to lower the centre of gravity. This classic configuration, combined with advanced Audi Space Frame (ASF) construction mating lightweight aluminium panelling to an aluminium space frame, provides the very best operating conditions for the futuristic chassis with its agile double wishbone set-up and standard Audi magnetic ride adaptive damping system. The Audi magnetic ride dampers swap conventional fluid for a magnetorheological solution containing minute magnetic particles that can be influenced by an electromagnetic field. By applying a voltage to the system’s electromagnets, the viscosity of the fluid is altered by the affected magnetic particles, increasing resistance to damper movement to iron out pitch and roll when necessary, and reducing resistance when ride comfort takes precedence. The system constantly monitors road conditions and driving style and reacts accordingly. The striking 19-inch ’10-spoke Y design’ alloy wheels naturally contend with the V10’s formidable output with the help of the legendary quattro permanent four-wheel-drive system, which apportions power to front and rear axles in constantly varying degrees dictated by road conditions. Ventilated and perforated 380 millimetre front and 356 millimetre rear disc brakes, which at extra cost can be upgraded to virtually fade-free ceramic discs, also help to instil complete confidence. As a whole, the configuration, which also includes a super precise gear shift and fast-reacting, communicative steering, has already been lavished with exceptional praise by critics the world over in the V8-powered R8. As a further safety enhancement feature that also adds a new dimension to the already much lauded styling of the R8, the V10 is equipped as standard with the world’s first all-LED headlamps. For the first time the high intensity diodes have been used for low beam and high beam settings, as well as for daytime running lights and indicators, intensifying the sports car’s visual drama. The list of subtle embellishments to the taut, emotive body of the R8 V10 also includes a high gloss finish for the grille and front air intakes, more pronounced side sills, wider side cooling vents within the contrasting ‘sideblade’, high gloss rear air outlets, oval exhaust tailpipes and a new rear diffuser. The everyday usability of the R8 has been as widely commended as its capacity to enthral drivers, and the V10 version will of course be no different. The much praised quality of the interior fixtures and the deceptive amount of space afforded by the generous 2.65-metre wheel base makes this one of the most easygoing super cars ever built, and the V10 with its extra equipment emphasizes this further. In the most powerful R8 to date electric adjustment and heating is added for the Fine Nappa leather-upholstered sports seats, and DVD satellite navigation and a CD changer playable through a 465-watt Bang & Olufsen audio system simplify and enhance day-to-day driving. An interior light package including LED footwell lighting, light and rain sensors and LED engine compartment lighting also comes as standard. Audi’s starter for ten – The new 525PS, 196mph Audi R8 V10 joins the highly successful V8 model in the UK in the spring of 2009 priced from £99,575 OTR.